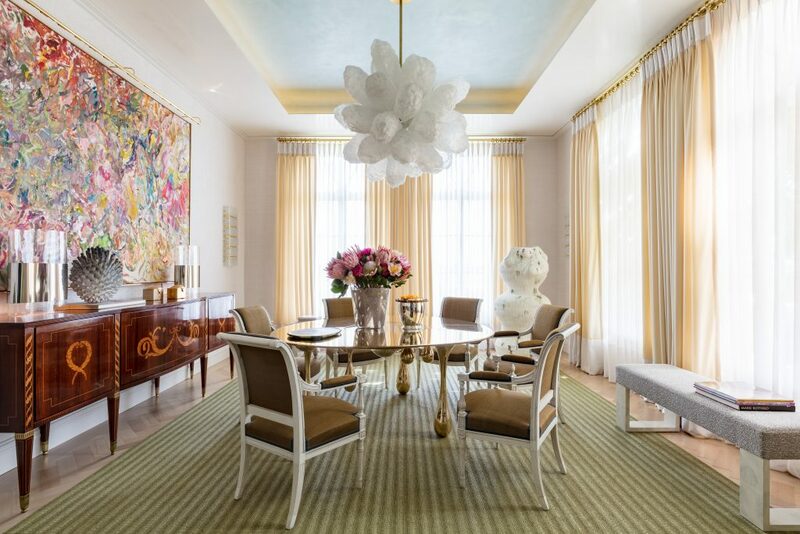 For the second year in a row, the high-profile Kips Bay Decorator Show House, a design showcase staple in New York City since 1973, comes south to Palm Beach bringing with it cutting-edge design trends, high-end and high-tech fixtures, original artwork and antiques. 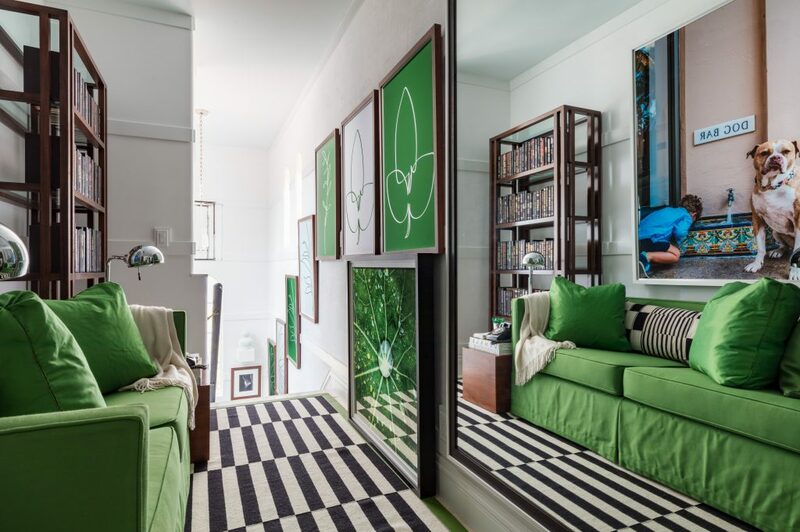 The Show House, which opened Saturday and runs through Feb. 20, offers an opportunity for interior design enthusiasts to have a first-hand look at the latest interior design styles and the designers who create them. Proceeds benefit the Kips Bay Boys & Girls Club and the Boys & Girls Clubs of Palm Beach County. The Fountain House, a 10,000-square-foot house rebuilt in 2000 and situated at 6215 S. Flagler Drive, is a Mediterranean-style home built on former swampland with water views of the Intracoastal Waterway. 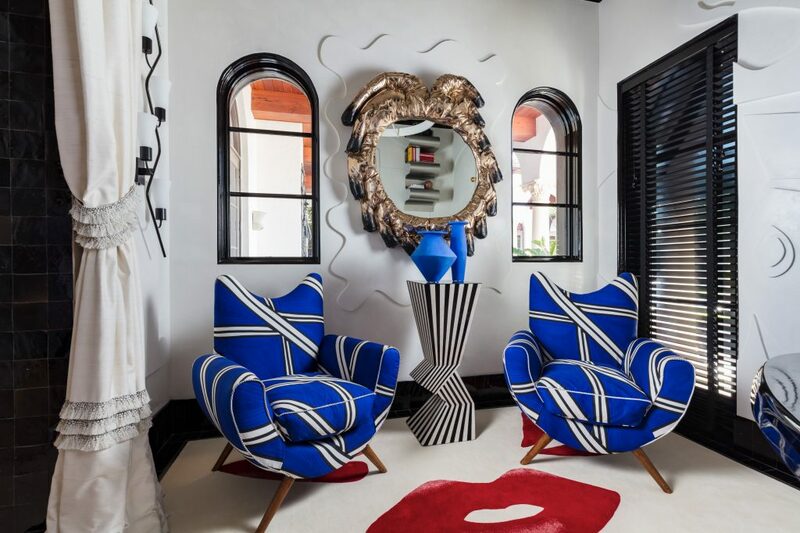 Over a period of four months, 22 designers transformed each room of the house into their particular vision, many utilizing design elements from the 1970s, such as the Maison Jansen bronze palm tree curated by Cindy Rinfret of Rinfret Ltd. in the entryway/living space. “Collected and traveled,” she describes as her aesthetic. 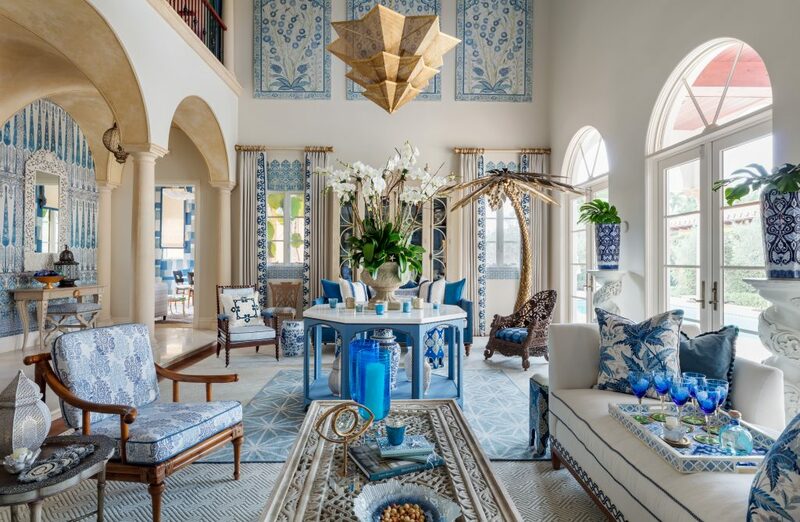 Utilizing Moroccan arches and style elements such as Moorish-inspired wall coverings, the blue-and-white themed room (echoing the Florida blue skies and water) is at once sophisticated and livable. From “Le Bubble Lounj,” the master bathroom designed by Krista Watterworth Alterman of Krista + Home; the grand staircase and halls transformed into “The Chinoiserie Garden Pavilion” by The Lee W. Robinson Company; to the newly landscaped grounds by Andrés Paradelo of Paradelo Burgess Design Studio, every square of inch of space has been decorated and renovated with taste, talent and imagination. 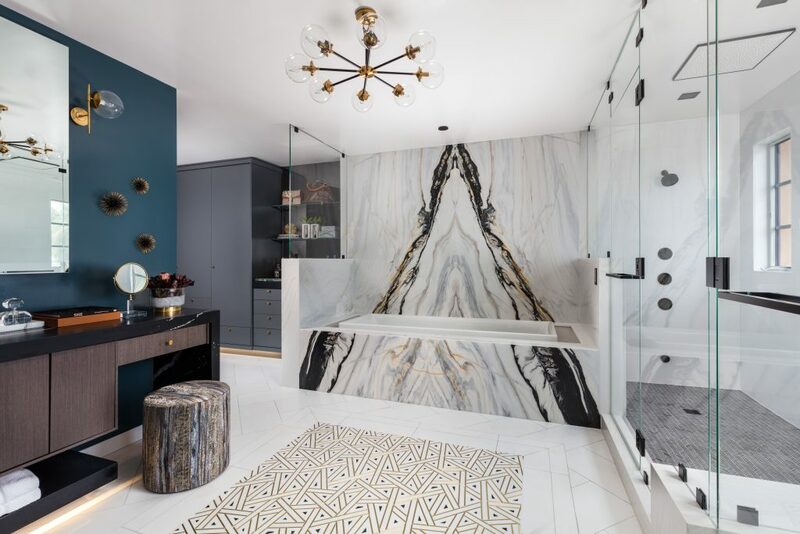 Bathrooms and kitchen feature top-of-the-line Kohler cabinets, hardware and accessories, including a digital chromotherapy infinity Jacuzzi that fills from the ceiling, an automated wall-hung toilet and rain shower with views of the waterway. Displaying unique personalities (think Christian LaCroix wallpaper in the kitchen pantry, Directoire antique chairs from 1790, an original Larry Poons abstract titled Nymphs and Satyrs, and an asymmetrical polished bronze and glass “dripping table”) created specifically for New York designer David Scott by Chinese artist Zhipeng Tan, Scott’s newly imagined dining room is at once classic and contemporary. The room also boasts a $200,000 800-lb. hand-blown glass chandelier reminiscent of coral clusters by contemporary glass artist Jeff Zimmerman. One of the highlights is the breakfast room. An “Ode to the Modern Woman,” envisioned by Jessica Schuster of Jessica Schuster Designs, features Schuster’s original design 3-D printed MDF wall panels, Elitis black-and-white checkered mother-of-pearl ceiling, a throw rug with three iconic red lips inspired by the Céline store entryway in 1960s Paris (also an original design and produced by Crosby Street Studios in NYC) and touchstones to Dali, Picasso and Le Corbusier. A 400-lb. bronze Misha Kahn Rasta mirror from Friedman Benda in New York City (where the modern woman can inspect her lipstick) completes the room. “Bedroom,” by Meg Braff Designs,” “Master Loggia,” by Louise Cronan Interior Decoration, “Master Bedroom,” by David Mitchell Brown, “Powder Room,” by Mark Williams Design Associates and “Guest Suite,” by Peter Dunham. 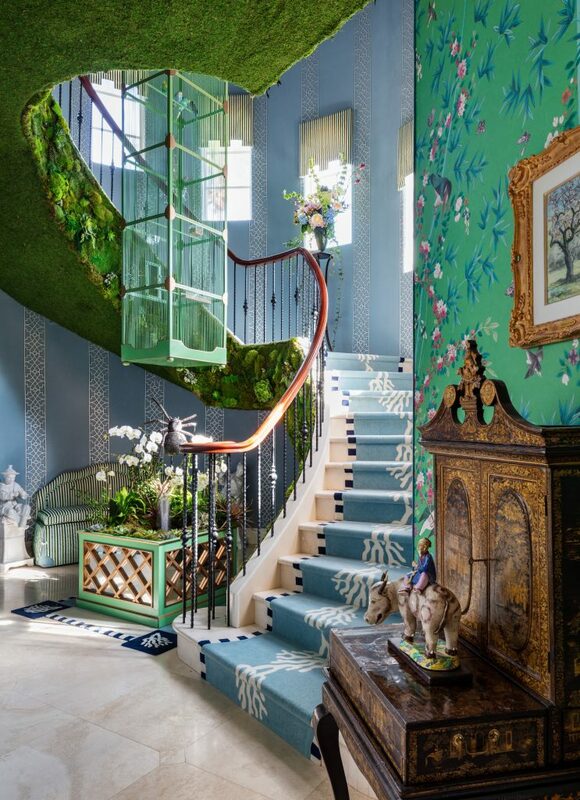 The Kips Bay Decorator Show House at 6215 S. Flagler Drive in West Palm Beach, is open from 11 a.m. to 5 p.m. Mondays through Saturdays, and from noon to 5 p.m. Sundays. The house is open through Feb. 20. For tickets ($35) and more information, visit kipsbaydecoratorshowhouse.org.